The modern breeds of Cocker Spaniels have arisen from two dogs. The first one is Obo, the father of the English Cocker Spaniel. The second, Obo II, was the father of the American Cocker Spaniel. Obo II was born in the USA because his mother was shipped there when she was pregnant. Teddy bear dogs are dogs that resemble stuffed teddy bears. With their cute round head and long flappy ears Cocker Spaniels certainly fit the description of a teddy bear dog, although some spaniels can grow quite large which throws their status as a teddy bear dog in doubt. Nonetheless, they are extremely cute dogs and as far as teddy bears go, there is a good case to be made that your old teddy bear at home has a lot of similarities to your cocker spaniel!. Nothing about the Cocker Spaniel’s history is certain. “Spaynels” are first mentioned in the 14th century and it is assumed that they originated in Spain. In the Cynographia Britannica by Sydenham Edwards written in 1801 the Land Spaniel was divided in two types – the Cocker Spaniel and the hawking, springing spaniel. Cocker comes because the dogs were hunting woodcocks. 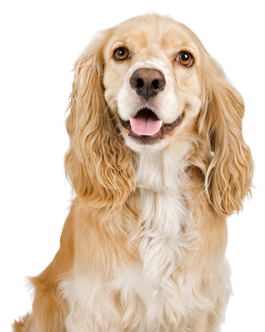 Cocker Spaniels have a wavy and thick coat which is short on the back and head and long on the legs, belly, ears and chest. The color of the coat can be light cream, black, red, brown or a combination of these colors, usually always containing a white color in the mix. The Cocker Spaniel’s coat requires dedication – it needs to be groomed, washed and trimmed often. Cocker Spaniels have a very sweet temperament. They are cuddly and affectionate. They love participating in family activities. They love exercise and hunting and are active, alert and playful. Even though they are hunters they are very sensitive, both physically and mentally. Cocker spaniels do not react well to harsh treatment and they tend to snap or growl when they are afraid or in pain. They need to socialize and be trained from an early age in order to be well-mannered. They need kind and careful treatment. They also have quite bad street sensibilities, so be very watchful if they are off the leash. The English Springer Spaniels and the English Cocker Spaniels were recognized as different breeds in 1892. The criteria for a dog to be considered a Cocker Spaniel in the 1870s was that they had a weight of less than 11kg (25 pounds). There was an even smaller breed of spaniel called King Charles Spaniel. Dogs whose weight was bigger than 11 kg were considered Springer Spaniels. Cocker Spaniels make great family dogs. They get along extremely well with children, but with proper introduction and respect from the children. They also get along well with other pets. They are really cute, endearing and loveable. DIY dog beds – How to make your own dog bed!